"Timber Creek High School Sky Dancers would like to invite you to shop at our annual craft show. The event will be held at Timber Creek High School in Keller on October 25, 2014 from 9-5. We will have variety of vendors, including jewelry, clothing, children items, home goods, candles, beauty products, hand-made items and much more! There will be dance performances, face painting, bounce house, concession stand, door prizes and a silent auction with some fabulous items!" 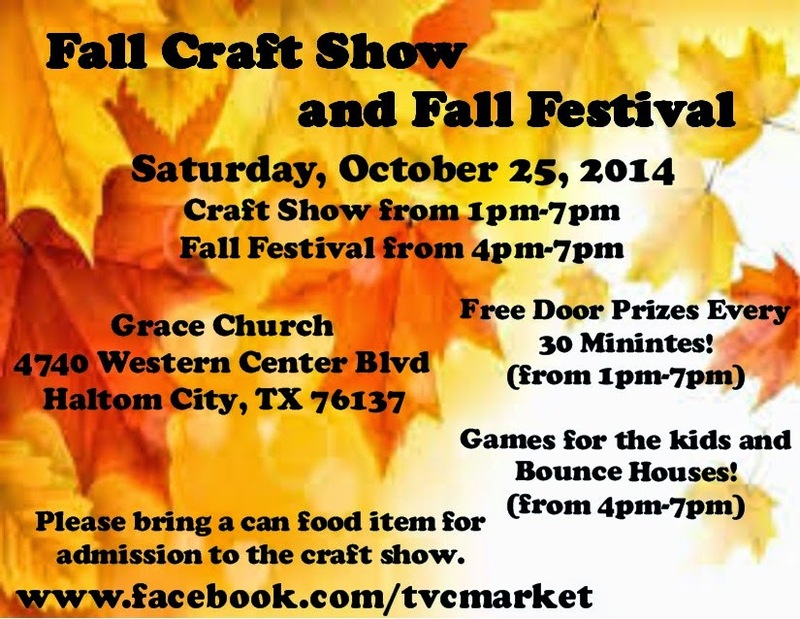 "The Third Annual Fall Craft Show with free door prizes every 30 minutes. Fall Festival from 4pm-7pm, with games and bounce house for the kids. Please bring a Can food item for admission to craft show. This year the youth group is sponsoring a fall festival as well! The event is going to be our biggest yet and proceeds go to support the worship and youth ministries of Grace Church! Can goods will support the food bank ministry! Can't wait to see you there!" Admission Fee: Please Bring a Can Food item for admission to Craft Show. "Come to the 32nd Annual Hearts and Hands Bazaar on Friday and Saturday, October 24th and 25th. Enjoy shopping with 60 vendors offering quality, handcrafted products. The offerings include a variety of jewelry,handmade baby items, doll fashions, granite cheese boards, candles, home decor, Christmas items, notecards, custom stationery, and writing instruments. Don't miss the huge bake sale, homemade lunch in our cafe, the coffee bar for desserts, and our second annual Christmas tree auction. Hours: Friday(24th) 10-6; Saturday (25th) 10-5. No admission"
"13th Annual Ladies Auxiliary Holiday Bazaar hosted by the Knights of Columbus Ladies Auxiliary. FREE Admission & Door Prizes. Shop from over 80 vendors. Christmas Tree & Wreath Silent Auction. Bid on a fully decorated Christmas Tree or Wreath. Bids accepted - 9 AM to 6 PM"
"You are invited to the 2nd Annual Grace Autumn Stop & Shop to be held on Saturday, October 25, 2014 from 9:00 am to 3:00 pm. This event will be held at Grace Community A/G Church located at 2525 Forest Vista in Flower Mound, Texas. There will be a variety of vendors offering items such as crosses with your favorite college logo, crocheted baby items and scarfs, art, quilts. Other items that range from the practical to the whimsical. There will be Door Prizes, Silent Auction, Bake Sale, and Car Wash."
"Sponsored by the Flint Academy PTF to benefit children with learning disabilities." "Along with our Story times, Dog Costume contest, activities for the kids, we again would like to bring in craft type vendors would be good as well as the jewelry vendors scentsy etc"
"The Kaufman Texas Scarecrow Festival is a community celebration welcoming visitors to our town and historic square. Join us for a parade, live bands, kids’ games and amusement, shopping with unique vendors, great food trucks, magic shows, bike stunt shows, circus acts, and a community blood drive to give back to those in need." "There will be all sorts of fun at our Annual Holiday Market. Shopping, silent auction, bake sale, raffles, live music, and WINE. Each guest will receive two drink tickets. This is going to be a great event. Come support our community. " "We have over 30 vendors with a wide variety of products/merchandise that fit everyone wants and or needs! Please come out and enjoy some stress free shopping while supporting local and small businesses!! "